This is the highest quality room on-board that you can relax in. You can see the ocean from your window, and enjoy an elegant voyage. 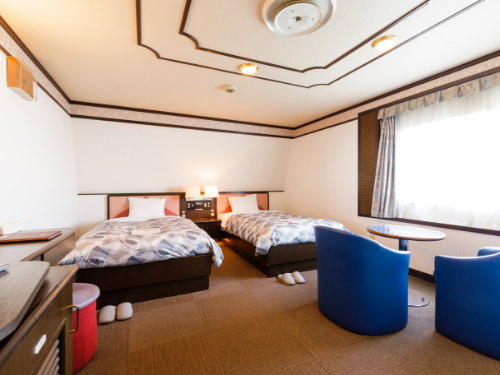 ※When renting the room as one guest, there will be a different rent fee charged (about 50%). Capacity of 4 guests with tourist’s beds. It is possible to rent it as a single room. ※ When renting the whole room, we will charge you (About 50%) of the rent per each guest that isn’t present. ※ You will not be able to open the curtains during the night. Once it is dawn you may open them. This is a room that you can relax in by yourself. It is a reasonably priced bunk rooms. ※You cannot reserve a specific room. The room number and bed number will be appointed when you check in. This is the most reasonable price. There are tables and chairs at the joint area for you and your friends to talk at. ※The seat will be appointed when crowded with many passengers.